Thanks for all your generously and articulately offered advice about silk painting. I have several questions I wonder if you would be willing to answer. STEAMER: I have the opportunity to purchase an aluminum fish steamer. I am thinking it might work very well as a silk dye steamer, but do I remember reading somewhere that the pot couldn’t be aluminum? Resist is used to draw the outline of an image on silk. 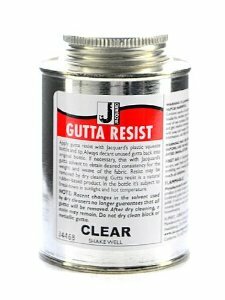 Used with liquid dyes, the Gutta stops the flow of dye at the resist lines. Gutta is removed from fabric by dry-cleaning. As long as you are using plain water in the bottom of the steamer, aluminum should be fine. We can’t use aluminum that will be in contact with vinegar, because the vinegar quickly corrodes the aluminum, turning the water gray. While I have seen a recipe that called for adding vinegar to the steaming water, this is unusual. All of the recipes for steaming silk dyes that I can lay my hands on right now call for only plain water. For immersion dyeing, an aluminum pot won’t do, because then you do need to use vinegar or another acid, or, for different dyes, soda ash or another high-pH chemical. Both acids (vinegar) and bases (soda ash) react badly with aluminum, and nearly all dyeing recipes call for either an acid or a base. FABRIC: I have been looking for jacquard PFP silks without success. I see in a demo you use a silk with a woven pattern–a jacquard–. Is PFP silk not required? or what is your source if you do use PFP fabric? Most silks will be fine if you scour them before use, to remove sizing, oils, or any other contaminants from manufacture, as well as any remaining natural sericin protein, which is a sticky gum that is a part of unprocessed silk. Don’t invest in a large quantity of silk from a particular source unless you have tested some samples yourself to be sure any problems can be removed. PFP (Prepared For Printing) or PFD (Prepared For Dyeing) silks do not need to be prewashed, though some silk painters prefer to wash even PFD silk, just to be sure. To scour silk, wash it in hot water (140°F); check your water temperature with a thermometer to be sure it is hot enough. Note that many washing machines these days are designed to add cold water even to a hot cycle. ProChem’s recipe for scouring silk calls for half a teaspoon of soda ash and half a teaspoon of Synthrapol per pound of silk. There are also scouring recipes that call for Orvus paste instead of Synthrapol, but again equal quantities of the detergent and the soda ash are called for. I don’t remember whether I’ve purchased from Thai Silks (http://www.thaisilks.com), but I know other other dyers have done so. They have some nice jacquard-woven silk. If it is not labeled as PFD, it should be washed or scoured before use. Is there a weight of fabric at which the gutta can’t be used successfully? I am looking at using 14 to18 mm habotai. What is your experience with silk painting on twill? When the fabric is thicker, you have to take greater care to be sure that the gutta penetrates throughout the entire thickness. If necessary, turn the silk over and go over the same lines on the reverse side. Always take a small scrap to practice on, before starting on a big project, to make sure that your gutta is the right consistency to penetrate, that the fabric is thin enough, and that your technique is effective. Sometimes thinning the gutta with a very small amount of solvent (assuming it is a true solvent-based gutta) helps it to penetrate better. GUTTA: I have read that the clear gutta needs to be removed by dry cleaning and even then sometimes can’t be removed. Has that been your experience? I am making scarves for apparel so I don’t want the stiffening of the colored gutta. TECHNIQUE: If I painted in stages, allowing silk to dry completely between applications, could I avoid bleeding where colors meet? In other words, once dried but not yet steamed, will the dye bleed if moistened but a neighboring new, wet color? Some of the unfixed dye can be expected to redissolve when remoistened. There will be less bleeding from a wet-next-to-dry application, like this, than there would be when painting wet next to wet dye, but you can’t rely on there to be none. 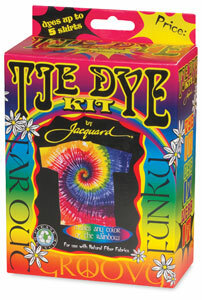 If you allow dye to dry, then paint the same color adjacent to it, some of the dye color is likely to bleed over. Try testing this on a scrap of similar silk. After a piece has been steamed, and any unfixed dye rinsed out, then new wet dye applied touching it, it should not cause the old dye to bleed. This entry was posted in silk painting on July 14, 2014 by pburch.